If you’re looking for some inspiration for your special day, look no further than a Valentine’s Wedding. Yes I know, Valentine’s Day can definitely be overwhelmingly pink, filled with candy hearts and teddy bears. However, with a modern twist, your special day can ooze romance. Deep reds, creams, hints of gold and rustic tones will create the perfect valentine’s ambiance, without all the cliché’s. To start planning a chic & modern Valentine’s Wedding, the perfect color scheme is essential. Burgandy, gold, beige and creams will set the subtle and elegant mood. With this brilliant palette, everything will fall into place. Starting with invitations, a modern brushstroke design with sophisticated gold calligraphy from Elli.com is the perfect mix of originality and simplicity. To match the deep reds of the invitations, the one tier ombre cake from Mito Sweets, is the perfect equivalent. Rich greens are the perfect addition to the decor. Besides the curling vines on the cake, pairing burgundy tones with an abundance of greenery, make for the ultimate romantic ambiance. Incorporating eucalyptus, vines and other leafy greens make for the perfect table decor and flower arrangments. Within the table decor and flowers arrangments, hints of gold and blush tie everything together for a charming dining experience. Now, what would a perfect valentine’s wedding be without the bride and the groom? A long bohemian lace gown with an elegant open back and an attached lace cape from Grace Loves Lace will add the perfect amount of drama. For the groom, a velvet burgundy tuxedo jacket, paired with the class white collared shirt and black pants, allows for tradition with an interesting twist that even goes along with the theme. A subtle boutonniere with beiges, blushes, greens, and a pop of red ties together the entire ensemble. Boutonniere: Taralynn Lawton & Bloomery Co.
Let the season of love inspired you! 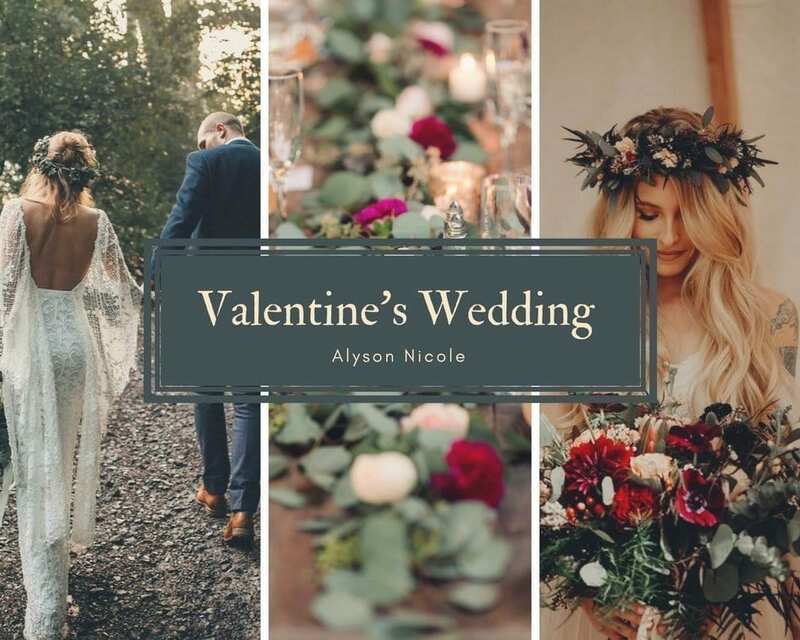 Have fun and create the valentine’s wedding of your dreams! I am Madison Good, born and raised in Yorktown Heights, New York. After graduating high school, I headed to Hofstra University to pursue a career in Public Relations, specifically Fashion PR. I am currently a Junior here at Hofstra with a major in PR and a minor in sociology. I love fashion and the freedom of expression it instills in each and every one of us.